We excel in bringing the best equipment and accessories to provide food and water for livestock and horses. We have a great choice of animal drinkers for turkeys and chickens. Our poultry selection includes all sizes of drinkers, from chicks and bantams to larger fowl. The Super Poultry Drinkers are available in 2� litre and 12 litre versions. These green and white animal drinkers have been created from sturdy, heavy duty plastic. Keeping the water fresh, the plastic is also resistant to ultra-violet light and frost. These animal drinkers have also been created with versatility on mind, allowing you to extend the legs to keep them elevated. The flat tops of the domes also allow for convenient filling, and the metal carry handle is a more secure alternative to plastic handle versions. 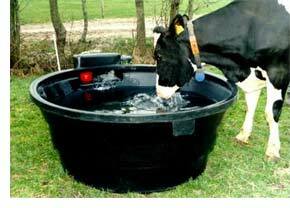 The Eltex range of animal drinkers are made from heavy duty sheet steel, and galvanised after construction. Providing the utmost in resilient, weatherproof design, Eltex animal drinkers come in differing sizes for various water quantities. The Eltex Auto Poultry Drinker has been designed to provide water for up to 100 birds. Including a ball valve to control the flow of water, this animal drinker can be connected directly to a water supply for a constant refill. The innovative removable grid is a great touch, preventing birds from fouling the water. For livestock and horses, the range of animal drinkers from JFC are designed to be tough, coping with heavy use in pen or stable. The DBL4 Double Walled Drinking Bowl is one of JFC's most popular animal drinker designs. Holding four litres of water, the double wall construction provides a strong and compact build. Thanks to the pre-drilled mounting holes, additional brackets aren't necessary. Complete with a stainless steel access cover and drain plug, this is a great solution for cattle and horses. Take a look through our online store - you can be sure that our selection has all you need for farming and agriculture. We have a huge range of additional products available, please call free for assistance on 0800 056 0002.